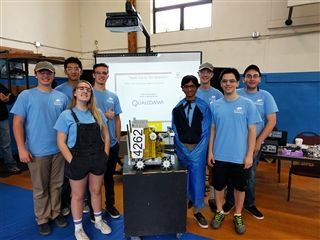 Upper school robotics team 4262 Ridgebots had a strong showing at their League Championship last weekend. They won the judged Rockwell Collins Innovate Award given to a team whose robot demonstrates a unique engineering solution to the game challenge. The team was a finalist in head-to-head competition, and also scored a third place for the highest judged award at the event - the Inspire Award. As a result of these awards, the Ridgebots qualified for participation in the San Diego regional championships on February 25.